Even today, the mysterious flight Nazi official Rudolf Hess to Scotland on May 10, 1941, remains shrouded in secrecy. To the people of the Scottish Highlands, the battles of 1940 had at the time seemed a distant concern. But the war returned in a peculiar manner when top-ranking Nazi Rudolf Hess’s plane landed in their country on May 10, 1941. …A rather strange event, even at the time. But even today, the events surrounding Rudolf Hess’s trip to Scotland are not fully understood. Hess was not the staunchest Nazi supporter. He was not anti-British in his political leanings, and did not agree with Hitler’s decision to go to war Great Britain after the invasion of Poland. He hoped that somehow, the British would come to their senses and make a peace deal before the country was drawn into conflict. Hess then began to make covert contact with like-minded people in Britain who shared his political ideals. Hess’s trip may have confounded the British government, but it had an even greater effect in Germany. Why did the German government say that Hess was now suffering from a mental condition? Is it possible that certain members of the high command knew in advance about Hess’s flight and were trying to put the onus on Hess alone? And what became of Hess when he landed? 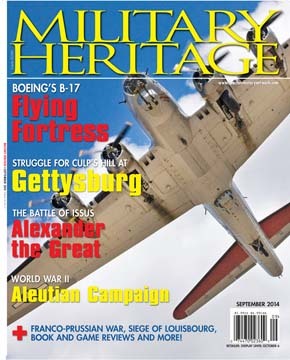 Inside this month’s “Intelligence” story in the September issue of Military Heritage magazine, you’ll learn all about Hess’s mysterious trip, and how it continues to spawn controversy and wild conjecture, both in Britain and in Germany. A vast Persian host arrayed on the banks of the River Pinarus in 333 BC stood astride Alexander the Great’s supply line. Anything short of a complete victory for the Macedonians meant certain annihilation. When Japanese forces gained a foothold in the Aleutian Islands in June 1942, a major commitment of U.S. forces was needed to oust the invaders. General Richard Ewell’s troops tried repeatedly to drive resilient Yankees from the high ground at Culp’s Hill on the Union right flank at the Battle of Gettysburg, but failed each time. In 1745, a rowdy army of New England militia set its sights on the French-held Louisbourg, the most forbidding stone fortress in North America. On August 18, 1870, the Prussians fought a savage battle with the French at Gravelotte-Saint-Privat. Despite a series of blunders, the Prussians’ superior numbers and artillery enabled them to carry the day. As always, please let us know what you think about these and other stories inside the September issue in our comments section. If there are any events or battles you’d like to see in the coming issues, we’d love to hear about them. Tags Alexander the Great, Battle of Gettysburg, General Richard S. Ewell, Japan, Louisbourg, Macedonian, Militia, Rudolf Hess, scotland. I recently committed to a 2-year digital and print subscription only to find that instead of the most current issue, the digital service only offered access to the July issue. I was prompted to subscribe by the articles currently featured and have therefore tried to determine why this offering isn’t available. Customer service has been unable to determine why as well….